Only 13 games remain in the regular season, yet the Boilers are playing their best ball of the season. Purdue has taken care of business in 3 must wins, but now comes the stretch of games in which the Boilers MUST get the signature wins they're desperately missing from their resume. Rumblings of a potential tourney run have been growing steam amongst the Purdue faithful (including yours truly! ), but the fact of the matter is that the Boilers would need a minor miracle to sneak into the tourney. 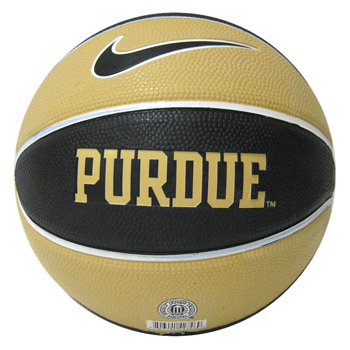 8 to 9 wins (depending on who they are against) should put Purdue on the bubble, but it's going to be very difficult to do. Several computers have us winning only two or three of the remaining regular season games. However, everybody saw the game on Saturday. Everyone felt the magic this team can produce when clicking on all cylinders. And maybe, just maybe, they've grown up enough to pull out a shocker. This Thursday would be the biggest shock of them all. "What do I do now that Michigan finally has a team playing to their talent level???" Purdue could really use to play a perfect game, but the biggest focus has to be on taking care of the ball on the offensive end. Michigan is such an explosive team and full of such great finishers, that turnovers will nearly always turn into points and will ignite the fans in Ann Arbor. On the defensive end, Michigan has so many weapons that you pretty much have to give the Wolverines something and hope they screw up. In order to have a chance, look for four Boilers to pack the paint, not allowing Trey Burke to create, or Glenn Robinson III and Tim Hardaway Jr. to drive. All three are typically good shooters, but not nearly as good as Nik Stauskas and his 50% mark from 3-point range. Stick someone on Stauskas with glue, and pray that everyone else is cold from behind 18 feet. Hammons will need to have the game of his life, as Purdue does have the offensive advantage down low against 6-8 Jordan Morgan or 6-10 Mitch McGary. A couple of early fouls though, and it could get ugly. Michigan IS coming off it's biggest win of the year at Minnesota, so could we see a hangover? Let's hope so. The number of guys they have that can beat you is staggering. Any of the starters could go off, which means "praying" for someone to get cold really means praying for EVERYONE to get cold. Purdue can hang with them for a half, but on the road against the number 2 team in the country, it's going to be really tough. Michigan is the heavy favorite and there's no reason to think they won't win big. Note that not ALL the computers hate the Boilers. In fact, the handicappers at Oddsshark.com have Purdue as the 46th best team in the country. Honestly, I trust the oddsmakers in Vegas more than anyone else - their jobs depend on getting these things right! While you're checking that out, look what Villanova did to recent #1 Louisville on Tuesday! With wins like that, it would have been really nice to have that game back. Still, anything they do helps our RPI, so we'll take it. And finally, Purdue embarrassed the Mountaineers so much that Bob Huggins apologized to all West Virginia fans. That makes me smile. Our Picks - We like to think we're better than Vegas. So throughout the season, we'll be "betting" a whole dollar amount versus the spread between $1 and $32, but we can't repeat the same value twice. The spread for this game is Michigan by 16.5.